Tradeshow News and Tips is for you, the Tradeshow exhibitor. Designed to give you the leading edge at your tradeshow, "Tradeshow News and Tips" will continually be updated with the latest in Tradeshow strategies, winning tradeshow designs and ideas to maximize your advertising dollar. This Tradeshow News and Tips column will show you some real tradeshow winners. Tradeshow News and Tips will explain what contributes to winning "Best of Show" and what makes a Tradeshow Display great. If you'd like to contribute your experience, I'd be happy to highlight your company, give you free advertising on our homepage and feature your contribution here at "Tradeshow News and Tips." In one word - Marketing! It amazes me how many times I get "marketing gurus" that want to jam as much text on their display as possible. 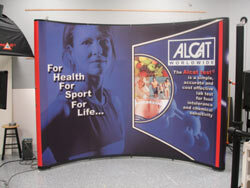 Ask yourself, the last time you were at a Tradeshow, how many displays did you stop at and read all the text? Statistics show you have four seconds to capture the attention of your "Prospect." So, if a picture says a thousand words, can you read one thousand words in four seconds? Most certainly not. Therefore when it comes between text and graphics, which should be given most attention? Answers the Basic Marketing Question - "What's in it for Me?" What makes this even more impressive is the designer. Shelly had never done a Pop Up Tradeshow Display before. We coached her and tweaked the display together. This was her first Tradeshow. Together we took "Best of Show." Congratulations Shelly. Best of Show!